Growing up I was a blueberry muffin fan all the way. I couldn’t get on board with anything other than blueberry. Until the day that I had a bran muffin warmed up with butter and peanut butter on it. Bran muffins were a weekly occurrence on the breakfast menu after that. Mostly because they are easy to take on the go. But another great reason was they are healthy, full of fiber and filling. I’m habitually 5 minutes late or right on time for everything so having quick and easy breakfasts has been a life saver. In 2007, I was diagnosed with celiac disease which meant I could no longer eat muffins, at least gluten filled muffins. Back then, most gluten free baked goods tasted like cardboard. I started making my own gluten free muffins. But could never recreate bran muffins that tasted close to the real thing. 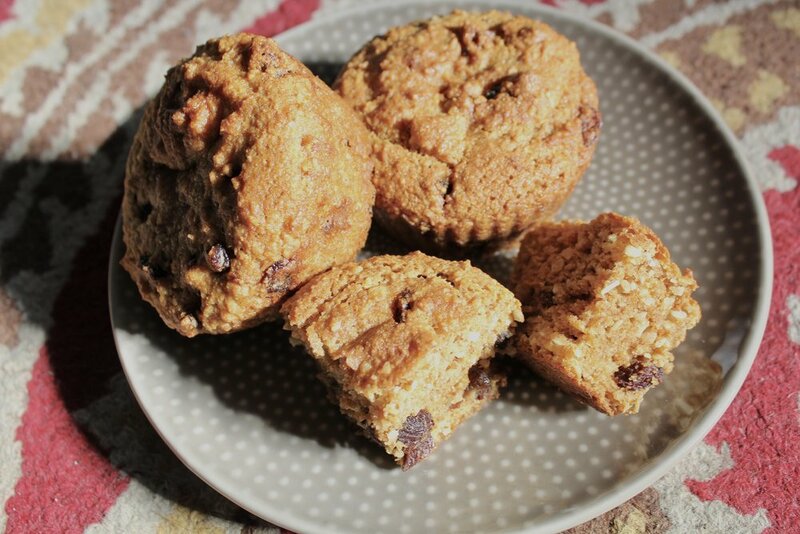 Going grain free a couple years ago, I had to adapt many of my favorite gluten free baked good recipes using almond or coconut flour. Coconut flour is it’s own beast but once you get the hang of it and knowing how many eggs or coups of nut milk to use helps keep the recipes from drying out. Baking can be tricky in general. Introduce flours that are out of the ordinary (from baking) and it makes for a lot of trial and error. Making “bran” muffins without the bran was hard and finding a substitute wasn’t super easy either. It took bit but I found using shredded coconut or ground flaxseed as a bran substitute works well. Shredded coconut is also a great substitute for oats, by the way. Making no’oatmeal cookies and bread with shredded coconut is delicious and super healthy!! Sometimes muffins can get dry using coconut flour so adding eggs, butter/ghee and nut milk (or water) give a nice moisture in each bite. The hearty but fluffy texture of these muffins makes them a great for a snack or breakfast on the go. Add a little butter or nut butter and you’re set! Preheat oven to 350 degrees F. and ready either 5 large silicone muffin cups or 10 regular sized, parchment paper or silicone lined muffin cups. Put coconut flakes in a food processor and pulse until roughly chopped. Add coconut flour, ground flax seed, baking soda and apple cider vinegar. Pour the remaining ingredients except the raisins into the processor and process until combined. Add the raisins and pulse a few times or use a spoon to fold into the batter. Spread the batter evenly between muffin cups and bake for 28 minutes or until an inserted knife comes out clean.